It’s not often you help to deliver your own granddaughter at your work place. But for Lynne Hewitt she did just that – and a month later she coached her other daughter through labour, who also went on to give birth at City Hospital where she is a Maternity Support Worker. “It was all very surreal,” recalled Lynne, 53, who has worked at the hospital for eight years. “I guessed both of my daughters were pregnant when we were out for a family party. I noticed they were drinking lemonade with orange juice so I asked them. Daughter Becki, aged 33, was the first to give birth in November to Niamh at the Serenity Birthing Unit, which is based at the hospital. “I was there throughout the labour and helped to deliver little Niamh. It was such a magical moment and a huge privilege,” explained Lynne. “Laura gave birth to George a month later in the hospital’s labour ward. I was there throughout the labour until she was taken into theatre. 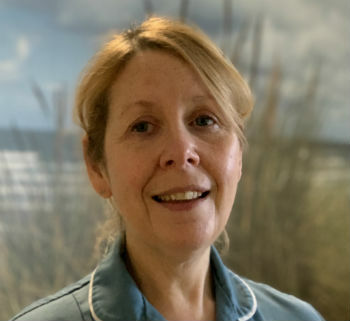 Lynne, from Bearwood, first began working in the maternity department eight years ago and joined Serenity two years later. Her job involves supporting midwives as they assist women in giving birth and making sure the environment is safe and clean for patients. “It’s such an unpredictable job,” she said. “I could be helping to look after women who are postnatal, but then on other occasions I could be assisting with the birth. I work varied shifts too. So what would she describe as her next challenge? “Every year women who give birth in February are asked to fill in a survey, which is run by the Care Quality Commission. When Lynne isn’t working, she of course, enjoys spending time with her new grandchildren, and going on family holidays. “I think I’ll be babysitting quite a lot over the next few years,” she laughed.